We had lots of requests to add a voice feature so kids could hear their words as well as see them. So we started working on this popular request. As we were working on this feature we realized that our users weren’t actually requesting the same things. Some of you wanted both sound and text, some wanted it to be left how it was, and some wanted just sound and no text. Our solution to this was to create a toggle in the “Settings” section. 1. Access voice feature options under settings. You have a few different options you may choose. If you select both “Use Audible Words” and “Show Words”, you will have both voice and text in the game HUD. 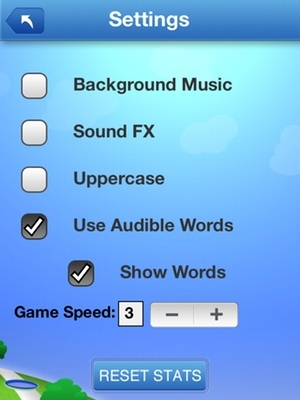 If you select just “Use Audible Words” you will only have the option of sound in the game HUD. If you would like to just show the text in the game HUD just select “Show Words”. 3. From here you name your list as usual. 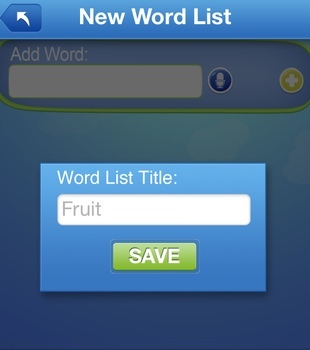 I will name my list Fruit and save my list name. 4. Ok from here you can start adding your words. I add the word “Apple”. 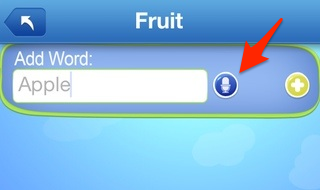 To attach sound to the word simply hit the blue record icon and speak the word into your devices microphone. 5. Once you have spoken the word hit the “Stop” icon. If you would like to confirm what was recorded simply tap the green “Play” icon. If you don’t like your initial recording you may rerecord your word. 6.Once you are happy with the recording of your word tap the yellow “Add” icon. 7. Once you have saved your word and it is added to your word list it will have a “Sound” icon.